- About Egyptian Magic The presence of the court magicians is not necessarily evidence that the magic is real. Though Alter and Rashi agree that the story is written from the perspective of someone who believes the magicians had real power, other commentators disagree. Notably, Samson Raphael Hirsch reads the magician verses in a way that presents them as frauds. Ralbag and Seforno are two other bold face names who said the magicians were frauds. Ibn Ezra, who also doubted their power proposes that the very word latayhem (enchantments or spells) indicates their chicanary. The word, he says, comes from l-h-t, or flame, which Robert Alter says links the work of the magicians to the "fire and flash technique of the illusionist." Those who disagree with Ibn Ezra and imagine the spells were real might say the root of latayhem is l-'-t or conceal. Even according to the ancient interpreters, who almost certainly thought magic was real, what the Egyptians magicians could do were merely pale imitations of Moshe's miracles. - The plagues: The stuff "everyone knows" about the plagues, is actually a matter of serious dispute among the Rishonim. For instance, if you go around telling people that one frog came out of the river, and that it multiplied as it was hit, you're disregarding contrary opinions of Rabbi Eliezer ben Azarya, Rashi and the Abravenel. If you say the Israelites weren't affect by the first plagues you're over-ruling Ibn Ezra. And so on. Against the crux: At the beginning of the parsha, God seems to say that he never once told the Patriarchs his four-letter name. Rashi says what this means is that Patriarchs weren't aware of the attribute represented by this name. [More] Alter points out that literally its true: There's no special episode, such as this one, in which God's four-letter name, or the meaning of it, is revealed; on the other hand, there's also no concrete indication that they were ignorant of it either. Anomaly: The second time Moshe's stick* is transformed into a reptile, the animal is called a tanin. Previously its a nachash. The difference? A nachash is an ordinary snake, but a tanin might be a crocodile, or a dragon. Historicity: The Ipuwer Papyrus is interesting but its significance is debated. Search for more information about DovBear at 4torah.com. A little long, but well played. Aside: What happened to the authentic Torah-true bottle on the head dance? Was it ever a big deal? If so, how did the vanguards of tradition let it fall out of style? Search for more information about Fiddler at 4torah.com. Play the game after the jump. Search for more information about the Office at 4torah.com. Pundits, man your stations. It seems that the Fox News commentator Tucker Carlson yipped  that Eagles quarterback Michael Vick should have been executed three years ago when convicted on dog-fighting charges. Many are now getting hot and bothered expressing shock that Carlson would actually call for Vick's execution—a tad extreme even for Fox. Generally, a pashkevil is a broadside posted on a wall that announced some new religious ban or rulings Sometimes, they appear in newspapers, often as paid advertisements. Recently, the Gedolim used a pashkevil to announce their ban on VIN. The problem with the pashkevil is it usually employs overheated language, and provides no real justification for the new rule or ban. Instead of arguing facts, as in a lawyer's brief, the author of a pashkevil attempts to frighten or shame his audience into obeying. Threats are sometimes made, and dissenting points of view, when they are represented at all, are demonized . In other words, the pashkevil harangues rather than convinces. The OJ Rabbi, who started the Twitter conversation about Christianity earlier this week, has responded. His comments are in red, my answers are in grey. In short, my view is that no one with any sense of history should be unhappy to see a weak Church. A few clarification regarding my post entitled "Xtianity, what is it good for?" The changes the Church made occured over the protests of traditionalists, and weren't the result of careful study and introspection. The changes were made not for reasons of truth, but for reasons of politics. After 2000 years, the Church woke up to the fact that its teachings on Jews were no longer viable, and that if it wished to remain relevant in the post-Holocaust world, the teachings that helped make the Holocaust possible needed to be reformed. Though the Church, perhaps, deserves some credit for this, its rather like the credit we might give to someone in 2010 who has finally updated from Windows 3.x. In other words, it was about freaking time. Ultimately, the victory here belongs to liberalism, for it was liberalism that dragged the Church into Vatican II, and it must be remembered that the changes came at the expense of traditional Church teachings which were modified long after sensible people already knew that these teachings were dangerous and wrong. (2) I recognize that individual Catholics have already taken some of these steps, and have fully repudiated their Church on these matters. I think that's great, and note that this represent a defeat for the Church. In yesterday's post I was perfectly clear that the problem is Church doctrine and policy, not the beliefs and behaviors of individual Catholics who have rejected these doctrines and policies. Christians who no longer accept offensive Christian doctrines are, in a some sense, "less Christian" which is something to be encouraged. Likewise, many non-Catholics have repudiated their sect's anti-Jewish teachings, and this is also something to respected and encouraged. Search for more information about horrible Popes and how their teachings caused Jewish misery at 4torah.com. When someone like Holy Hyrax says, as he did two threads down, that he has "more in common" with RW Christians what does he mean? That he hates homosexuality, is suspicious of science, thinks women ought not work, and crushes on Sarah Palin? That he admires the Ned Flanders model of masculinity? That he's bought into creationist misinformation and obfuscations? I'm really not trying to be snide. I'm honestly trying to work out what he means. Because when I say I have more in common with seculars (though I believe in God and do mitzvos) I mean that the average secularist and I both value common sense, despise superstition, enjoy discovering the true nature of things, respect real history, and think freedom and tolerance(*) should trump just about everything else, because the dialog and exchange of ideas these two values promote are the most reliable ways to discover truth. Search for more information about this topic at 4torah.com. This "gem" has been floating around Facebook. I don't see any reason Orthodox Jews to be sharing this incendiary parody. Is it funny enough to be a parody? Or is it offensive enough that it should not be shared? Search for more information about crazy Israeli videos at 4torah.com. Xtianity what is it good for? Is trend away from religious Christmas to happy holidays good or bad from Jewish perspective? I say bad. In 1982, the top 1 percent of pop stars, in terms of pay, raked in 26 percent of concert ticket revenue. In 2003, that top percentage of stars — names like Justin Timberlake, Christina Aguilera or 50 Cent — was taking 56 percent of the concert pie… Nearly 30 years ago, Sherwin Rosen, an economist from the University of Chicago, proposed an elegant theory to explain the general pattern. In an article entitled “The Economics of Superstars,” he argued that technological changes would allow the best performers in a given field to serve a bigger market and thus reap a greater share of its revenue. But this would also reduce the spoils available to the less gifted in the business. The Jewish community has its Rabbinic superstars as well, on several levels. First, think of the national ubiquity of a Shmuley Boteach or a Daniel Lapin. How many aspiring rabbinic opinion-makers are being squeezed out of the marketplace by the books, radio programs, and op-eds of the few? Better, think of the number of blogs, podcasts, and columns devoted to responding to, or promoting, the ideas of a small number of idea generators. We don’t need more than one Daniel Gordis, nor more than one Peter Beinart, if their articles and books have an international audience. 1 - A full El Al plane pushed off from the gate at JFK around 6 last night and then sat frozen on the tarmac for almost ten hours as the airport closed. The passengers are still waiting (in the terminal, mostly) for their flight, which was rescheduled several times and is now set to leave at 9 PM (27 hour delay). 1a - There were a bunch of other Israel-bound passengers stranded at the airport at nearby gates. 2 - Although El Al fed the passengers on the plane (treatment on the plane was the best that could be expected), they were unable to provide anything more than vouchers at the airport (until about 3 PM, when some sandwiches showed up). Vouchers are pretty worthless for kosher food at JFK, especially since Hudson News wouldn't accept them. 3 - Enter "the frum community of the Five Towns and Far Rockaway," who by early afternoon had delivered about five million pizzas; countless bagels; muffins; croissants; individual cereal packs; chips, pretzels, etc. ; oranges; juice; milk; and I don't even remember what else. Passengers had to leave the gate area to go to the chapel area to retrieve food, but most people brought back more than they needed to share with others. We've been at the airport now for about 26 hours (10 of those on a plane) and are looking at another four before we get on our plane. It has hardly been fun, but our anonymous coreligionists have made it far less arduous and even a little heartwarming. 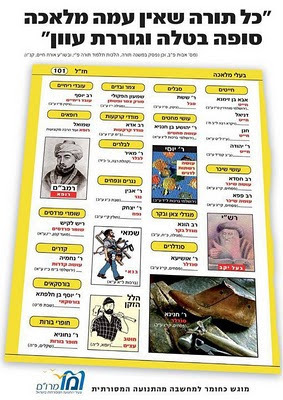 Titzku l'mitzvot. Search for more information about Five Towns at 4torah.com. Enough articles and posts have been written about the recent confusion about emunas chachamim and Daas Torah. To the sheeple, these terms have been taken to mean that when a gadol speaks about a subject, be it halacha, hashkafa or science, the gadol is speaking with Divine Assistance and the gadol's words are binding. Rabbi Rivlin holds this to be true. As do the many commenters that Matzav.com allows to filter through their fascist comment queue. This opinion suffers severe flaws in logic and is in dispute with many Torah principles. But what bothers me is this: When did this happen? I understand that in Chassidus this idea is a a cornerstone to their avodas Hashem. But how and when did this become the leading opinion in non-chassidic circles? At Matzav, Gavriel Rivlin has published a vicious attack on Harry Maryles who crossed the honorable, disinterested, gentlemen at Matzav by questioning the rabbinic ban on VIN. In all honesty, Rivlin sounds like every clueless H.S Rebbe I've ever known. His endless screed against Harry Maryles and VIN (see it after the jump) can be summed up as follows: Turn off your brain and kneel before the Gedolim because this is Torah. Well those of us who aren't graduates of whatever brainwashing academy produced Rivlin know it doesn't work that way. We know the Gedolim aren't infallible, and we know they are often manipulated by zealots. Ample evidence of this exists, and several individual cases have been confirmed. We also know that open inquiry, free speech, and criticism make a culture and a community stronger, not weaker. And we know that someone who attempts to end an argument by accusing his opponent of acting disrespectfully is holding a losing hand. More importantly, we know that telling the facts as we know them in an open forum, where others can respond with their own best understanding of facts, is the best way to discover the truth. Perhaps Harry is wrong when he says the VIN ban was manufactured by Satmar politicians, but we won't know if the matter is never discussed. By recommending silence, discretion, and blind obedience, Rivlin is only protecting those who are corrupt and dishonest. If the architects of the VIN ban have acted honorably, they have nothing to fear from a discussion of their methods and motives. Though men like Rivlin refuse to see it, Judaism is not a cult, and nowhere are we required to offer Rabbis our blind obedience. Certainly, Rabbis are entitled to respect, but if their motives and decisions are never discussed or defended we've created a situation that's ripe for abuse. Men - even our gedolim - are not angles. Like anyone else, they are capable of errors and of being corrupted. Our only protection is dialog, and we must not accept Rivlin's attempt to bully us into obedience by suggesting that dialog is a chilul hashem. The very fact that the Gedolim refuse to explain this ban is enough to make thoughtful people suspicious. We deserve to be treated like adults, and we're entitled to to how and why this decision was made. In 2010, its simply not enough to stick a hotly-worded polemic on a wall. If the Gedolim have a case against VIN let them make it clearly, calmly and coherently. If they are unable or unwilling to do this, they should not expect our compliance. A pro Obama article from Avi Shafran! The OU, in the latest Jewish Action, has convened what they term a 'symposium' to defend the idea of Mesorah. I can only assume it's as a response to the krumbagel video. The website Vos Iz Neias was banned a few days ago for a litany of speech offenses. I don't want to reopen the discussion of the video or VIN now. But I do want to talk about the vital place of blogging and anonymous videos in modern-day frum Judaism. Search for more information about People's Court at 4torah.com. This is from January 2006. My local Hasidic Rabbi took the night off last Friday night. He didn't speak before Kabalas Shabbos, and he didn't appear at his regular Friday night shiur. Why? Because it was Nittel Nacht, per the Greek Orthodox calendar, and on Nittel Nacht it is his custom to act like a mourner and forgo all Torah learning -- even on Shabbos. - The words: וּבְנֵי יִשְׂרָאֵל, פָּרוּ וַיִּשְׁרְצוּ וַיִּרְבּוּ וַיַּעַצְמוּ--בִּמְאֹד מְאֹד; וַתִּמָּלֵא הָאָרֶץ, אֹתָם (And the sons of Israel were fruitful, and swarmed and multiplied, and grew very vast; and the land was filled with them)are a reference to the creation story and the promise to Abraham. - When the daughter of Pharoh looks into the basket, we're told "v'hinay na'ar bocheh". Most take this to mean, "and behold the boy [i.e. Moshe] was crying. An infant, however, is never called a na'ar. This leads someone (forget who) to say that the crying boy was actually Aaron, who was standing on the river side watching. - Before Moshe murders the Egyptian who was beating an Israelite man, the verse says that "he looked this way and that way, and when he saw no one." Typically, we understand "Moshe" as the antecedent for the pronoun "he". Some, however, point out that there has to be something unique about this particular incident; presumably Egyptians beat Israelite all the time: Why did Moshe interfere this time? Perhaps because such attacks were actually forbidden by Egyptian law, a possibility suggested if the words are instead read "[and the Egyptian] looked this way and that way, and when he saw no one." After checking to see that no one was around, the Egyptian proceeded with his illegal attack on the Israelite. Moshe interfered this particular time, because such attacks were illegal and therefore unusual. - The betrothal scene returns this week. Again, our hero is at the well in a foreign land, where he once again performs an act of physical valor. Again, he is greeted by a woman who hurries home with news of his arrival, and again the betrothal is agreed to after a meal. This time, though, the usual young woman is multiplied by the formulaic seven. - Though the verse (1:10) says "Come, we must deal shrewdly with them or they will become even more numerous and, if war breaks out, will join our enemies, fight against us and leave the country" Rashi, based on Sotah 11a, emends it as follows "And it is as if it were written: and we will depart from the land, and they will take possession of it." - The text presents Shifra and Puah as the only Hebrew midwives, though as Ibn Ezra points out, they would have had to be leaders of much larger squads. - When he meet Moshe's father in-law he is called Reuel. In the next episode his name is Jethro. - In Chapter 3, the mountain of God is called Horeb. Later it is Sinai. - The whole "chatam domim l'molis" story is a bizarre mystery, written in a crabbed style that suggests the narrative is alluding to well-known story. James Kugel says its an etiological tale, created to defend the idea of infant circumcision. As Kukel tells it, the well known expression "חֲתַ֥ן דָּמִ֖ים לַמּוּלֹֽת" seemed to suggest that circumcision was done to adults, not children. This story then, with its explanation of the expression (Kugel translates "אָ֚ז אָֽמְרָ֔ה" as "it was then she said"), was created to establish that the words "חֲתַ֥ן דָּמִ֖ים לַמּוּלֹֽת" are really no defense of adult circumcision. - Moshe asks to be allowed to take the Hebrews on a three days' journey into the wilderness. This does not mean, as if often supposed, that they plan to be away for three days. What's actually intended is a three day trip into the desert, a day of prayer, and a three day journey back, thus 7 days away from work. - Its really ok if you change your names: There's plenty of evidence that the Israelites took Egyptian names. - Rashi identifies the midwives as Miriam and Yocheved. This is because the text (1:21) tells us: [God] made for them batim, meaning households or lineages. Yocheved is matriarch of the priests and levites, and King David is a descendant of Miriam. - The verse says Moshe's mother saw he was good. Rashi doesn't take this at face value. Here's the how and why. - The verse says the King of Egypt died. Rashi says all this means is that he contracted leprosy. Here's why. - Who was Moshe's Pharaoh? - Moshe's floating among the reeds, foretells his great victory at the Sea of Reeds. - At the well, Moshe saves seven sisters, fitting his future role as savior of his people. - Pharaoh demanded that all Hebrew males be thrown into the river, but the carrying out of this command is precisely what saved Moshe. - Both Moshe and Sargon are sent floating down a river, rescued, and grow up to save their people. In this post I say "So what?" - What was Yocheved thinking when she put Moshe in the water? There are at least two ways to read her story, each having some support from the classic commenters. Search for more information about ParshaNotes at 4torah.com. The pathetic annual telethon continues. If you've ever received a moments pleasure or enjoyment from the things we do here on DovBear I ask you to please toss something into the collection plate. Every little bit helps with bills and expenses of course, but contributions of any amount are also your way of affirming that you value the service provided by this blog. Though the blog rumor that I'm actually a Cyborg detective voiced by Don Adams is gaining traction, the truth is I'm an ordinary human being just like, well... more than a few of you. Support for the pathetic annual telethon is your way of saying "keep up the good work." Those of you who are also ordinary human beings must understand how valuable such a message can be. Additional offer: DovBear is now accepting kvittles!! Attach a request to your contribution / pidyon and I swear to do everything within my power to compel the forces of the universe to fulfill your wish no matter how petty or depraved that wish might be (results not guaranteed) (by which I mean "thanks for the dough.") However, if you ask for something easy, such as a post on a particular topic, an answer to a particular question, or a plug for your nonboring, nonpathetic blog, that favor shall be instantly granted. Opportunity for cheapskates: I'm in some contest, that offers a $500 prize. Those of you unwilling to donate to the blog, or buy my book, can instead help me out by going to this facebook page and clicking LIKE on my comment. Search for more information about stuff you can do to make me smile at 4torah.com. Presenting a fabulous new ode to the holidays written by G.A. What was it like to live in Mainz c1000 when the Kolonymous family of piyut writers were active? How did it feel to read one of their liturgical masterpieces for the first time, and realize that you were holding something brand new that would undoubtedly withstand the test of time? Read this new poem by G.A and see for yourself. A fabulous new ode to the holidays written by G.A. Today's pathetic, see-through attempt to cripple the competition, was posted by loser blog Matzav, where they are self-righteously dancing on the graves of VIN. Like the good, little, fraudulently-pious bloggers they are, Matzav has reprinted the Kol Koreh in English under the headline Gedolim Publically Denounce Chillul Hashem of Vos Iz Neias and its Advertisers; Issue Issur Chomur. Can you say Nogeah b'Davar? 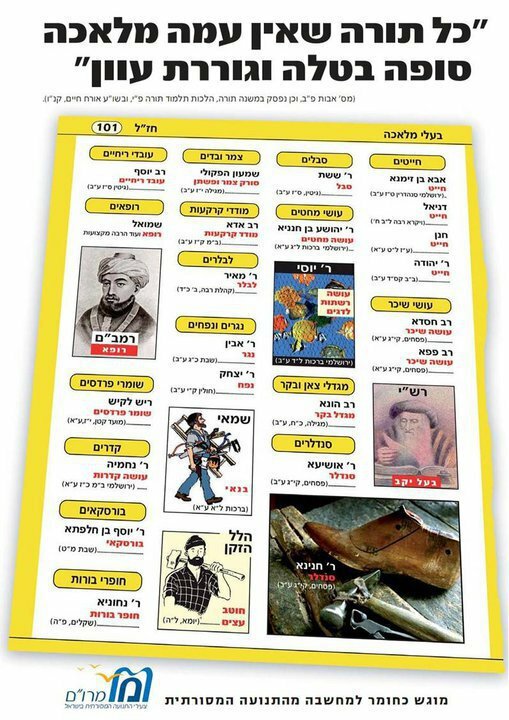 And of course the little add-on at the end about how "Matzav.com was asked by rabbonim to post this story" only makes things worse. What Rabbis actually asked Matzav.com to run down their chief rival? Its either a lie, or the request came from an idiot. Also, disturbing is how Matzav seems unaware that are guilty of every crime VIN is alleged to have committed. If Matzav had any brains they'd realize they're next on the list to get banned. However, I can't say I am entirely surprised. When Matzav was new, one of their minions frequently appeared on my threads with little announcements about how Matzav was going to be fair, and moderate. Links were helpfully provided (though just try leaving a link to your on blog on Matzav thread). In time the commitment to fairness and moderation was replaced with a fetishistic allegiance to daas torah, and its been downhill from there. Search for more information about Matzav's pathetic, see-though attempt to cripple the competition at 4torah.com. What do Sarah Palin and insane, anti-Semitic ex-Gitmo detainees have in common? You may have heard that an ex-Gitmo detainee went crying to Al Jazeera that evil Jews used Jewish witchcraft to drive him insane, forcing him to do things like urinate in his milk. (2) Sarah Palin also believes in witches. In the video you can see her standing docily as some lunatic preacher prays for Jesus to protect her from "every form of witchcraft." Apologies to the non-Hebrew readers in the audience. Translation on request. What happened to the Valmadonna? A New Anti-Semitic, Anti-Gitmo Myth is Born A former Gitmo detainee tells Al Jazeera that the Jews use witchcraft at Gitmo. Search for more information about DBN at 4torah.com. Sorry, but my premise was not that halacha and morality are the same thing. (1) My premise is that we --all of us -- use our own sense of right and wrong, our own moral criteria, to decide how to interpret the words of the Sages. There's nothing wrong with this, by the way. Its inevitable and part of being human. The problem comes when people deny they are engaging in interpretation, and insist that their apologetic reworking of something a Sage said is consistent with what the Sage originally meant. In this case, Rabbi Akiva clearly says men may divorce their wives even if its just because "he found someone more appealing". It sounds ugly to our ears, I agree, and deeply unfair to women but to claim Rabbi Akiva meant something else, is not right, and not supported by the evidence. Search for more information about mashups at 4torah.com. When Nobel Peace Prize winner and Holocaust survivor Elie Wiesel visited Fox News' dingbat morning show Fox & Friends last week, the chyron labeled him "Holocaust Winner" Elie Wiesel. Fire every intern! But congrats on the win, Elie Wiesel. In a separate report, they effusively praised Anne Frank's dairy, calling for worldwide lactose tolerance. Primo Levi picked up the save. The only thing missing is Bert Parks singing, "There he is, Mr. Hol-o-caust..."
Search for more information about FOX at 4torah.com. When Sotheby’s first put Valmadonna up for sale almost two years ago, the auction house exhibited the entire collection — every manuscript and book — in its showroom on the East Side of Manhattan. Once word of the exhibit got out, Jews and gentiles alike flocked to see it, waiting in lines that snaked around blocks outside Sotheby’s. And for good reason. The most spectacular manuscripts and printed books lay flat in numerous glass cabinets where you could stare down at their title pages, while on 20-foot-high shelves lining the walls of the immense showrooms, the imprints of all the cities and towns of the inhabited Jewish world over the last 600 years loomed above and around you. The exhibition was the closest one could ever come to seeing the entire Jewish people in its generations gathered in a single enclosed space. There is a famous rabbinic legend to the effect that when Moses received the Torah at Mount Sinai, not just the Israelites who had left Egypt in the Exodus but the soul of every Jew past and present stood at the foot of the mountain. Looking at Valmadonna at Sotheby’s was like standing at Sinai. This captures perfectly what I, and everyone I know, felt when we visited the great library. Failed Messiah is reporting that VIN, a news aggregator blog, has been placed under Rabbininc ban. All the big names seem to have signed it. My hunch? The ban was organized by the accused xxxxxxxx who runs YWN. Why do I say that? Because the emphasis of the ban, which was certainly written by an interested third party and then given to the Rabbis for their signature, is DO NOT ADVERTISE on VIN, not do not read it. If I'm right (and I have no evidence) this wouldn't be the first time an unscrupulous businessman manipulated the Rabbis for personal gain. 2. All the Rabbis have done here is shown how weak they are. When you ban a book or a web site, you announce to the world that you're powerless against a stronger idea. A ban is a sign of fear. 3. Also, the blog-reading public is going to ignore the Rabbis, as always, further demonstrating their impotence. Search for more information about the VIN ban at 4torah.com. I really don't understand the controversy over Sonderkommando Revolt, a new video game that lets you revel in the wholesale slaughter of Nazis. 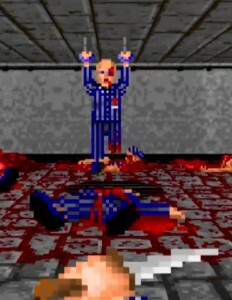 Though I agree the images are about as disturbing as choppy 8-bit images can be, I'm still at a loss to explain why the ADL, Heeb Magazine and others are aghast. The point of the game is not to glorify the murder of Jews. The point is to kill Nazis. Other games let you play quarterback for the Giants, this one let you live out the ultimate Jewish fantasy. You're at Auschwitz with a machine gun, and no one can stop you. When Inglourious Basterds was released it faced some of the same criticism. People didn't like the idea of an action-adventure movie centered around the Holocaust. It seemed vulgar and disrespectful. Writing in the Atlantic, Jeffery Goldberg ended the argument with three paragraphs. Did these two do something wrong? John Partilla and Carol Anne Riddell fell in love about two years ago and were recently married. To celebrate the occasion, they did what many couples do and submitted the story of their relationship to the New York Times for publication in The Vows, a regular feature. Partilla and Riddel were married to other people when they met, and though they insist that no adultery was committed, the article does describe some of the devastation left in their wake, including wounded children and angry ex-spouses. Predictably, some Defenders of Family Values are in an uproar -- "They broke up two families for an infatuation!" said one of my FaceBook friends -- but as I reviewed the facts of the case, I found myself asking: What exactly did they do wrong? In the video below, some singer blames us for killing Jesus, but overlooks our "bad behavior" because what she really wants for Christmas is a collection of hot, wealthy Jewish boyfriends. Note: Its apparently a parody of something Mariah Carey did. No idea what. Search for more information about back handed face slaps at 4torah.com. There's someone new and worthy of support in the world of Jewish blogging. Nope, I don't mean DBN, where we continue to mine unexplored corners of the journalism world for odd and interesting articles. I mean this, a new and valuable site dedicated to defeating the lies and absurdities of the infamous FrumTeensModerator. Though of you who were here during the Glory Days of Jewish Blogging may remember that beating up the FrumTeensModerator was a hobby of some bloggers back in 05. I know Golden Era GH did it a lot (Silver Era GH didn't bother, and bronze Bronze Era GH, or "XGH"as Mountain Dew fans refer to him, is just lame.) I suppose I did too but honestly can't recall, and there's too much here to sort through. Whatever the case, it didn't do much good. FrumTeensModerator remains an idiot and a source of much misinformation. For those too lazy to click, here's a summary of what's there: The new blog uses a respected book to show that FrumTeensModerator is lying when he says R' Aharon Kotler refused, on principle, to enter Y.U. In fact he lectured there. The blog also proves that FrumTeensModerator is wrong when he suggests all Jews in every time and every place always agreed that married women must cover their hair. *This has been the subject of some of my fiercest debates with clueless yeshiva folk. For some reason, they think they are serving the interests of Torah by making false claims about Yeshiva University's relationship with R. Shach and Rav Kotler. I also find it aggravating that these same self-righteous frauds who cluck their tongues with displeasure whenever I refer to a dynastic Hasidic Rebbela with fewer than 3 honorifics, cheerfully refer to R. Joseph Solivetchik as "J.B."
Search for more information about new and exciting blogs at 4torah.com. Make it a daily stop. ALSO: Please support the pathetic telethon with a sizable donation. This weekend, I heard a famous Rabbi declare with no hint of self awareness that he was"positive" that his efforts to accomplish a particular worthy goal was "blessed by Rabbi Shimon Bar Yochai"
When an audience member asked how the Rabbi knew this, he replied: "I can feel it"
Search for more information about stupid things people say at 4torah.com. Can't anyone give a good reason to keep gays out of the military? Predictably, our self-appointed religious leaders are celebrating the end of DADT by announcing their objections to permitting gays into the military; just as predictably their objections are asinine. After the jump see a typical protest, with my commentary. They, appropriately, are in pink; I'm in italics. By continuing to wish me a Happy Chanukka, or worse, a Happy Holiday, you are demonstrating ignorance of my culture and calendar. Though your tinsel wrapped celebration is still on the horizon, our holiday ended two weeks ago. The menorot have been put away, and the latkes are no longer frying. Even the Macabeats have finally vanished into the mist. I understand that you mean no harm, that you are in fact attempting to include me in your winter carnival, but the invitation is hereby declined. Christmas is yours, not ours. We exclude you from Rosh Hashana, Passover, and the rest. There will be no hard feelings if you return the favor. Search for more information about condescending, and unwanted attempts at inclusion at 4torah.com. Aspiring Rabbis of New Jersey? NEW YORK (CBS 2) — Four New Jersey Yeshiva students have been charged with bias intimidation after being accused of harassing a black school bus driver. The driver told Lakewood Police that the teenagers praised the Ku Klux Klan, then crowded behind her in a threatening manner as she was driving on Tuesday. The NAACP called the situation disturbing. “To me, it’s sad. Here we are in the 21 st Century, and we have this kind of intimidation going on,” Jim Waters, president of the Ocean County NAACP, said. The Yeshiva also filed a complaint against the driver, saying that the driver acted inappropriately. The driver has been moved to another route while the investigation takes place. Residents said it was a complete shock and that they need more details to have the full story. “I’m extremely surprised. It’s totally out of character for the boys in this school, and until we hear what their side of the story is, it’s difficult to comment,” one man said. Shame the little dears don't seem aware of the KKK's view of Jews. And because this is Lakewood, you have to guess their KKK education came at around the dinner table, not in History class. Search for more information about Jewish embaressments at 4torah.com. Use your credit card or paypal account. Not hard. Also not anonymous, but whatever. Search for more information about pathetic grasping attempts to enrich myself in exchange for the free daily entertainment at 4torah.com. As we conclude Sefer Berayshis, you're reminded and invited to contribute something to bedek habayis if you've found ParshaNotes edifying. Click to see this week's edition. The Simon Wiesenthal Center, attempting to capitalize on antisemitism and win a little publicity for itself, has published a list of the Top 10 Antisemitic Slurs of 2010. Though there's something vulgar about reducing Jew-hatred to a top 10 list, I know how the world works, and understand that this is an effective way to raise awareness. It's not the Wiesenthal Center's fault that the world responds best to silly lists, and bite-sized commentary. Also, there's nothing wrong with horn-blowing. I fully support the Wiesenthal Center's efforts to sell themselves, and their important mission. I would like to teach some of my neighbours some manners... I don't care if they wear frock-coats, and funny suits and hats covered in plastic bags, and insist on wearing their hair in ringlets (if they're male) or covered up by wigs (if they're female), but I do think they could treat their neighbours with a bit more courtesy and just a little bit more respect.... I didn't realise that goyim were about as welcome in the Hasidic Jewish shops as Martin Luther King at a Klu Klux Klan convention. I didn't realise that a purchase by a goy was a crime to be punished with monosyllabic terseness, or that bus seats were a potential source of contamination, or that road signs, and parking restrictions, were for people who hadn't been chosen by God. And while none of this is a source of anything much more than irritation... it makes me sad. Is this antisemitic, or is it an altogether accurate portrait of life in places like Monsey and Boro Park. (The article has many more examples of shabby hasidic behavior) Haven't we all see the sort of behavior the article describes? So why is it antisemitic to identify and complain about it? Moreover, the article isn't only about Jews. It concludes with parallel complaints about the Muslim community, with the angriest language reserved for female circumcision (that makes her much more than "sad") Aside for the comments about Britain's abdication of responsibility in allowing British schools girls to have their "labias hacked off", Patterson's message is simply that all people should be better behaved and less dismissive of each other. Who disagrees with that? Later today, I hope to have something to say about some of the other borderline examples of antisemitism that made the Wiesenthal Center's list. Swiped from Daniel B's FB page. What will Columbia’s new Center for Palestine Studies become? Kevin Spacey to Play Jack Abramoff in "Casino Jack"
Search for more information about news at 4torah.com. Tzip, a great friend of this blog, has fired the first shot of WAR ON CHRISTMAS 2010. Her target is some law-maker who seems fully unaware that he might be sharing the planet with non-Christians. I say make him listen to the Maccabeats for the next two weeks. That'll learn him. Now I own R. Malkiel Kotler, too! of Rav Malkiel Kotler on on your bedstand or sukka wall. Feeling my pain, a friend and reader decided to make his contribution to the pathetic annual telethon in the form of a photo of Malkiel Kotler. Put your brand on it, he said. Why should those blogs be the only ones to make believe that they own the rights to the likeness of a sage of Israel? And so it was done. In time, I hope to complete a branding siyum, and affix my sign and seal to photographs of every great person who has ever lived. Search for more information about stuff I do when I am bored at 4torah.com. A disclaimer that really should not be necessary: I don't necessarily accept any of the claims summarized and discussed in the post that follows. The point is to provoke discussion by making you aware of various problems and their solutions. Here's a brief, yet entirely authoritative post, on the complicated issues surrounding Reuven's loss of his firstborn status. It starts, as most things do, with a verse in Genesis. Each year, the four Lakewood Roshei Yeshivot attempt to colonize new areas and raise money by participating in what's called a "Lakewood Shabbos" with each Rosh Yeshiva functioning as something like a scholar-in-residence at one, or more, of the neighbored shuls. Drashot are given, friends are made, and after shaboos, checks are written. Aside from the fact that Lakewood has yet to reciprocate by inviting the Y.U Roshei Yeshivot to N.J for a "RIETS Shabbos" its all good fun. The Roshei Yeshivot get to enjoy the pleasures of a business trip; their groupies get to see them in person and collect autographs or blessings or whatever; and those who wish to be separated from their money are provided with a comfortable bkovidik forum where this can occur as painlessly as possible. Last year, one of the Roshei Yeshivot, R. Malkiel Kotler, created a commotion during his visit to Flatbush when he made a public speech at the Agudah of Ave L. in which he associated Modern Orthodoxy with Esav, and heretical sects like the Saduccess and Karaites. As I said at the time, lumping tens of thousands of Torah-observing Jews together with our traditional enemies was a pretty damn evil thing to do. This sentiment was echoed on dozens of blogs, and helped to produce a formal disavowal from the Rosh Yeshiva's spokesman. Apparently one Flatbush shul, the scene of the original crime, in fact, is still not satisfied. If you'd like to help us aggregate interesting stories, email DovBear. Kimmel gets sued for mocking us. Carmel Fire: Let the finger pointing commence! A future Maccabeat: Too Cute. What would you do if you were stuck in traffic?